NEW Bumble and Bumble Treatment Products! 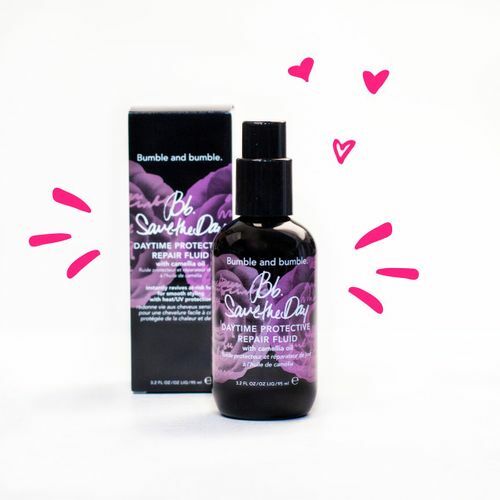 Bumble and Bumble is introducing two new treatment products, Save The Day and While You Sleep. They target existing damage as well as damage that could happen in the future from either chemical or mechanical damage. These products are even proven to help against free radicals including sun or water damage. They are packed with antioxidants that will help nourish and revive your hair almost instantly. Save The Day is to be applied at the beginning of your day (and before your styling products) to help protect against heat styling and has UV protection too! It comes in a lightweight fluid formula, so it is great for all hair types. It will smooth, soften and repair split ends. While You Sleep is to be applied before bed. This product is an overnight restorative mask and application which allows the product to really penetrate in to the hair and give you soft and "swingy" hair for the morning. Be sure to come in and ask your stylist exactly how it would benefit your hair type so you can have the most healthy and shiny hair you can have.